Formalin-fixed paraffin-embedded (FFPE) specimens have been largely ignored because of the recognized difficulty in isolation of proteins from such specimens. The analysis of formalin-fixed paraffin-embedded (FFPE) specimens is desirable because FFPE are the largest and longest time-spanning collections of patient materials in pathology archives around the world. Moreover, because the clinical records are available, and the clinical behavior and outcomes for many of the cases are known, FFPE specimens are the most ideal specimen for translational studies of cancer. 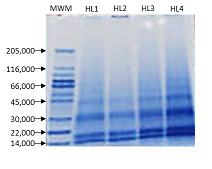 The ToPI-F2 is developed specifically to permit the isolation of total proteins from Formalin Fixed Paraffin Embedded (FFPE) specimen for 1D-PAGE and mass spectrometry (Figure 1). 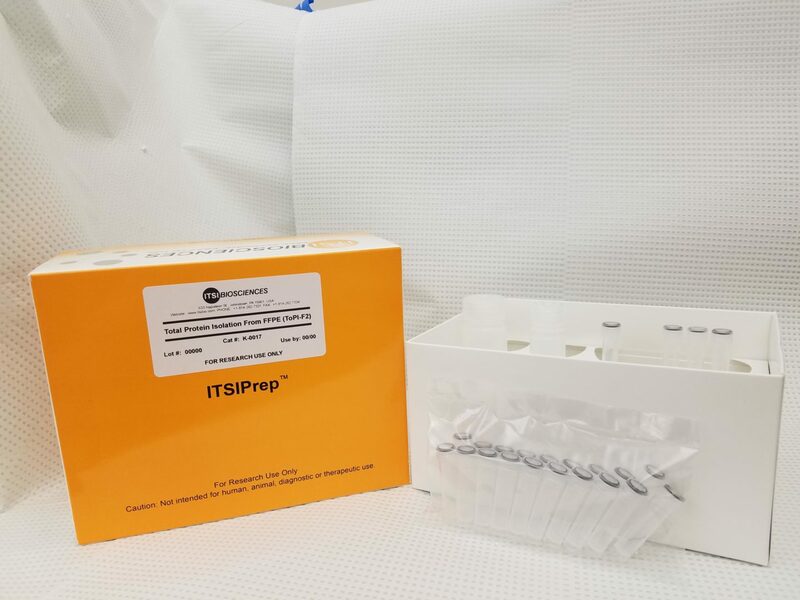 Each kit contains all the reagents needed in a ready-to-use format and the standard operating procedure. ToPI-F2 has been used to isolate proteins from FFPE samples stored for up to 5-10 years. The protocol and reagents provided in the kit is sufficient for isolating protein from 10 x 5 (10u thick) specimens. Approximately 5,000 ug/ml – 10,000 ug/ml of total protein can be extracted from 5 sections (~10u thick each) obtained from samples fixed with 10% buffered formalin and stored for up to 5 years. Note that the 1D-gel profile will vary according to the type of tissue, length of storage and fixation protocol. Also, depending on the desired protein yield, type of tissue, formalin fixation protocol and duration of storage, it may be necessary to adjust the number of sections used and protocol to compensate for the inherent difference in tissue types and age of FFPE specimen. Fig 1: 1D-PAGE gel image of ToPI-F2 Human Lung Tissue1D-PAGE gel image of protein isolated from formalin-fixed paraffin embedded (FFPE) human lung tissue using the ToPI-F2 kit. MW is molecular weight marker and lanes 1-4 are proteins isolated from four different lung specimens. Approximately 8ug of total protein were loaded per lane.